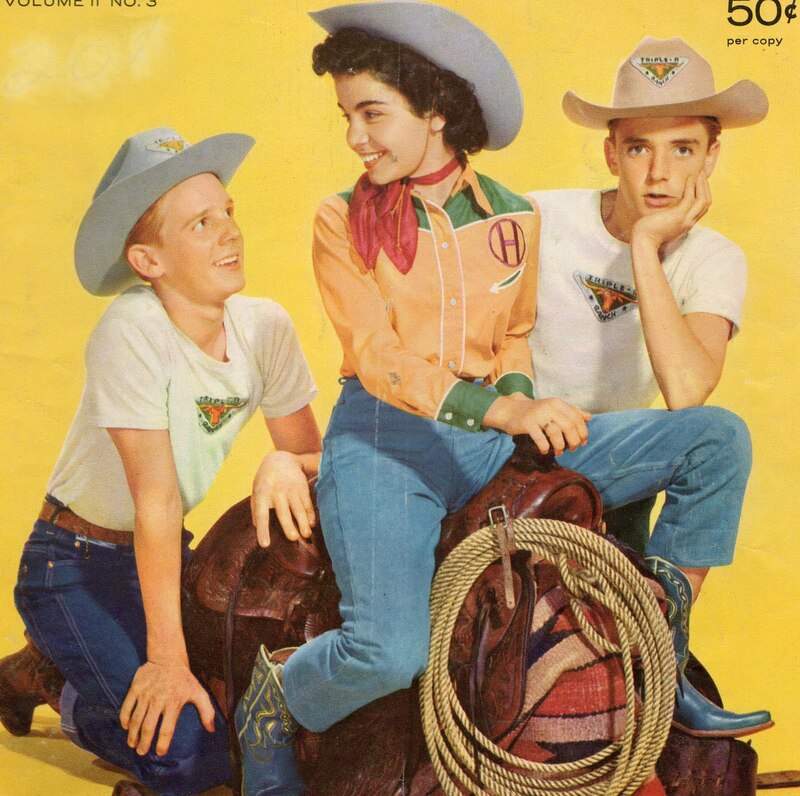 Spin and Marty and Annette in 1957. A lifetime's dream realized, in an afternoon spent with the Mouseketeers. It's probably useless to try to explain to younger generations the impact the Mouseketeers, the child performers on Walt Disney's Mickey Mouse Club, had on children in the 1950s. In those early days of only black and white television, children's programs were few, and were shows like Howdy Doody. But The Mickey Mouse Club featured real kids, talented kids who sang and danced and seemed to have charmed lives of Hollywood fame and "belonging." As a lonely child growing up in New York City, I imagined what their world was like, dreamed of being one of them, or just being lucky enough to meet them - once. I never realized that a whole generation of kids felt the same way about the Mouseketeers. And of course, a generation of boys fell in love with the most popular Mouseketeer, the lovely Annette. The girls mostly fell for teen hearthrob Tim Considine, and wished they could be friends with Annette, or Doreen. So you can imagine my pleasure when, half a century later, I really did become friends with Doreen! It happened because we both worked for Warner Bros. The studio lot has something like 20,000 employees, and I work at home, so I never expected to meet her, but one day in the course of the Harry Potter Lexicon trial, in which I was being prepared as a witness, I happened to spot her nameplate in the legal department - and there she was! I gushed and enthused (much to the perplexity of the lawyers), and Doreen and I quickly became friends over some very sparkling lunches. But the minute I walked into the Burbank Marriott hotel and conference center, the atmosphere was electric and I felt thrilled to be there. The room was filled with people all excited to be meeting the celebrities, who were sitting at tables around the room. You could walk up to anyone you chose, quite casually, and chat, take pictures, buy pictures - or not. I didn't bother even looking to see what other stars were there (though you can look at the roster if you're interested: http://www.hollywoodshow.com/ ). 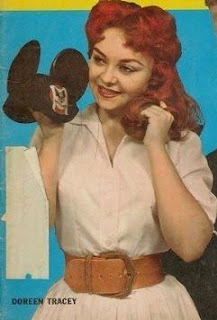 For me it was about the Mouseketeers, and that was that. And there they were! The first I saw was Sharon Baird. She greeted me graciously, and allowed me to take her picture. 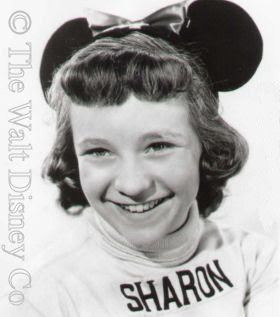 Here's Sharon in her Mouse days, when she was the best female dancer on the show, usually paired with the amazing Bobby Burgess. Next to Sharon sat Karen, with her lovely daughter, who resembled her greatly. Karen's in a wheelchair, result of a long-ago car accident, but she seems limited in no way and is a lovely woman, with the same sweet charm that made little Karen stand out. She was always paired with cute Cubby, who was supposed to be there today, but I was disappointed to learn that he'd missed his plane and couldn't make it. 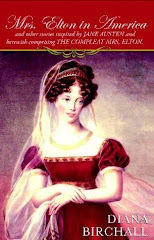 Then I found Doreen, and any shyness cannot exist in her bubbly star presence! Wearing late Mouseketeer Cheryl's starry specs, flirting and bantering and signing autographs, she's the life of the party, the kind of person you can't take your eyes off - yet down-to-earth, pragmatic, funny. She immediately made me feel like part of her gang, which, of course, was exactly what I'd longed for all those years ago. I shouldn't say I "also met" Tommy Cole, because he was adorable, and talking to him felt like I'd known him all my life - which, of course, in a way I have. 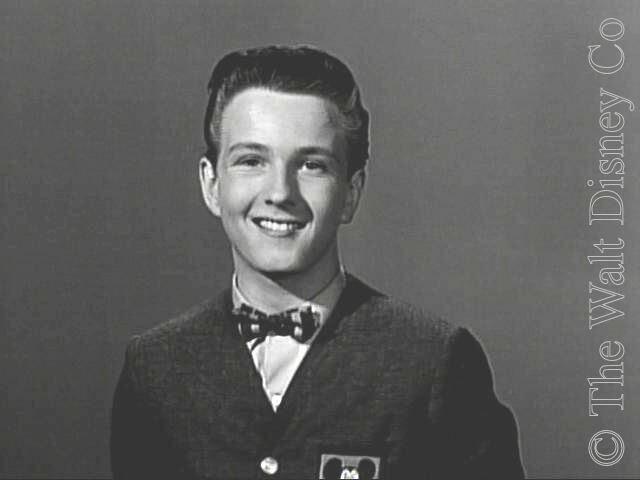 He shared in common with the other Mouseketeers a complete understanding and sympathy about how their contemporaries and fans felt about them, and while they clearly enjoyed the friendly adulation, they were unaffected and truly appreciative. It was clear that, although they'd never expected that their success on a kids' show half a century ago would carry on and have permutations in their lives for so long, they appreciate and cherish everything about it. The lad as the dishy singer of the show. These older pictures, I should say, are taken from the Original Mickey Mouse Club website ( http://www.originalmmc.com/ ), except for the magazine covers, which are my scans. The pictures today were all taken by a most kind and friendly fellow Mouse fan and writer, Julie Snyder. She urged me to go over to Spin and Marty and said she'd take my picture - something I, fearless and indomitable woman of parts though I am, actually rather trembled over! Another friend and fan, Ross Neville, was there too and it was fun to step back a bit and share our excitement. Tim Considine and David Stollery of course are now in their sixties, like most of the rest of us, but they're looking wonderful: very recognizable as themselves, and such a joy to see. 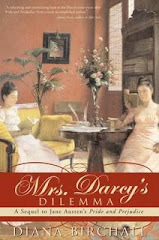 Regular friendly fellows, who took my prattling and gushing in very good, kind spirits. 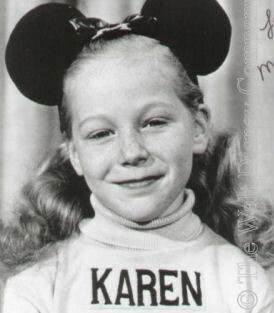 Such memorable encounters might well be enough for one day, or one lifetime, but there was more - the Mouseketeers had a professional photo session, and, as Doreen's friend, I was allowed to watch. It was somehow both beautiful and touching to see them walk into the photographer's room and hit their marks, just as they must have done on the show in 1957. They needed no instruction in forming a "Mouse" group, posing, and turning on the brilliant Mouse smiles and waves. A few fans had pictures taken with them (I didn't ask what it would cost! 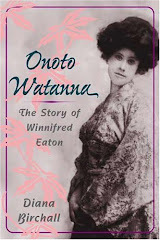 ), but the wonderful moment came when they burst into song. And they still had it. With exactly the same hand gestures, movements and steps as fifty years ago! It was stunning, amazing. They really were unusually sprightly, charismatic people - then and now. I felt chills down my back, and another fan afterwards told me, "I had goose bumps." It was a moment. Perhaps sweetest of all, though, is this picture, where I think you can see how much they really all do still care for each other. "Through the years we'll all be friends...wherever we may be." Yes. Who knew it would turn out to be true? But they made it so. As I drove home, I thought some thoughts about mortality. Of the nine original Mouseketeers, Cheryl is gone and Annette is an invalid. Bouncy and eternally youthful as the remaining ones are, they're getting on, as I am. I hadn't realized, perhaps, quite how far on we are in life, and there's naturally a sadness to that. But what a shining moment this brief recapture of youth was for me. Thanks so much for sharing your experiences. I would have loved to be there and met the crew. Who knows, that may happen in the future. Lonnie, it's an honor and delight to have your comment on my blog! I did know that Cheryl wasn't in the first season, and I know your fascinating and informative blog well, and have read your book. I'd have loved to pay proper tribute to you, one of the true originals - only to my disappointment, you were not at the event! 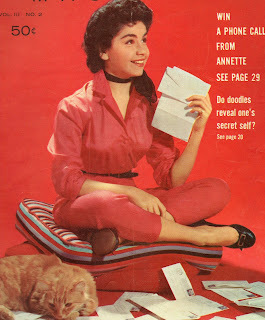 Doreen was also a favorite of mine. So nice to know they were friends for life. My sister and I got hooked on the MMC in the early/mid 70's thru syndication on a Pittsburgh tv station. I'm glad so many mice are still doing well and looking fine.